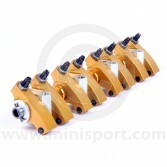 Check out the Mini Sport range of alloy roller tip rockers. 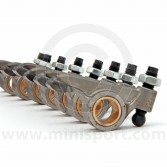 Designed to increase performance and reduce valve and guide wear our roller tip rockers are all precision CNC manufactured in our own engineering facility. 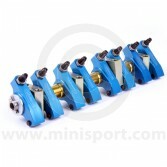 Mini Sport roller tip rockers are available in 1.3, 1.5 and 1.7 ratios to suit all Mini models from 1959-2001 in all applications from road to race. 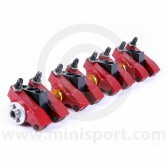 These roller tip rockers are just part of Mini Sport's large range of Classic Mini cylinder head components which also covers standard rocker parts, rocker covers, cylinder head bolts and studs, valves, valve springs, head gaskets and complete heads for the Mini 850, Mini 998, Mini 1100, Mini 1275, Mini SPi and Mini MPi.